Poverty includes bad conditions and/or experience of life. This means more than simply material poverty or lack. It is the meaning implied by the statement with which the World Development Report (WDR) 2000/01 Attacking Poverty opens ‘Poverty is pronounced deprivation in wellbeing’ (World Bank 2000: 15). ‘Multidimensional poverty’ is then the same as ‘multidimensional deprivation’.2 Well-being is the experience of good quality of life, and ill-being, its opposite, the experience of bad quality of life. This applies especially where material and other deprivations and disadvantages interact and reinforce each other (see Figures 8.1–8.4). The promise of both participatory research and the focus on well-being is that they will enable us to hear genuinely different voices, voices that speak from and about realities other than those configured by development discourse and institutions. 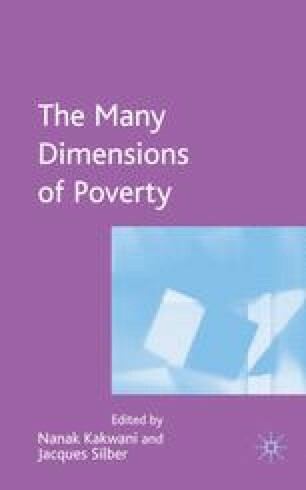 For comments on an earlier version of this paper I am grateful to participants in the Conference on The Many Dimensions of Poverty at the International Poverty Centre, Brasilia, in August 2005. I thank Francisco Filho and Dee Donlan for support and assistance with the diagrams and editing.